Blue Mountain Lodge is located on an island on Bell Lake, inside Killarney Provincial Park in Ontario, Canada. Killarney Provincial Park is considered the crown jewel of the wilderness canoeing parks located in Ontario, and has been here since 1964. The park was created as it was one of the favourite locations of some of the Group of Seven painters, including A.Y. Jackson and Frank Carmichael. The lodge is at the end of Bell Lake Road, however, as we are on an island, there is no drive up access. We transport you across the lake (approx. 1 km) by motorboat. From Toronto (approx 400 kms): Drive north on Highway 400/69 to Highway 637 to Killarney. Turn left (west - the only option) and travel 36 kilometers and then turn right on Bell Lake Road. (Pay attention once you pass Tyson Lake Marina.) Bell Lake Road is 10 kilometers long. (It is a gravel road and so drive with care and watch out for dips!) At the end of the road, drive past the parking lot on your right and drive into the area with two buildings. If no-one is there, point your car at the lake and someone will be over shortly. From Sudbury (approx 100 kms): Drive south on Highway 69 to Highway 637 to Killarney. 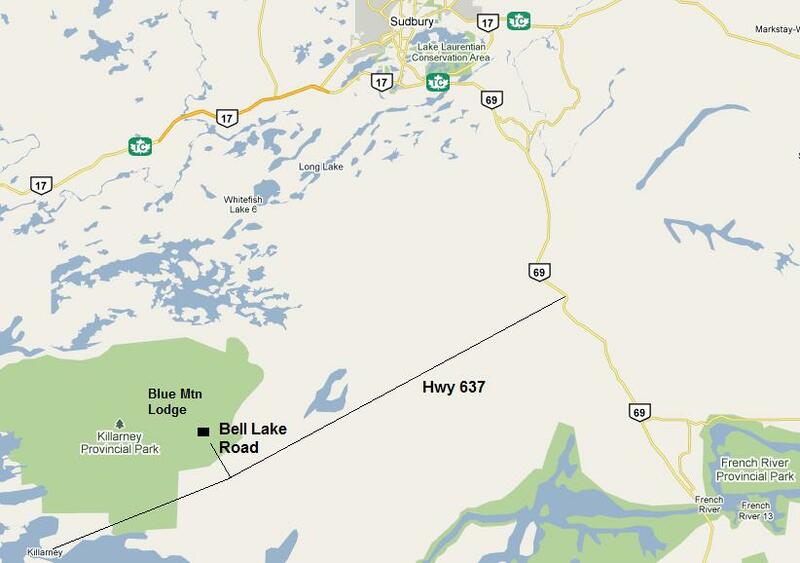 Turn right (west - the only option) and travel 36 kilometers and then turn right on Bell Lake Road. (Pay attention once you pass Tyson Lake Marina.) Bell Lake Road is 10 kilometers long. (It is a gravel road and so drive with care and watch out for dips!) At the end of the road, drive past the parking lot on your right and drive into the area with two buildings. If no-one is there, point your car at the lake and someone will be over shortly.